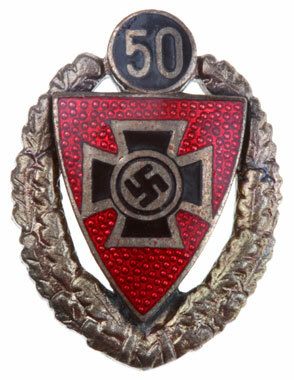 50 Yr. NS-RKB (Nationalsozialistische Reichskriegerbund): National Socialist Reich War Veterans League: based on the DKB (Deutscher Kriegerbund) from the 1870s. By 1938 it incorporated all of the varied veterans associations into it and was re-named the Nationalsozialistische-Reichskriegerbund. 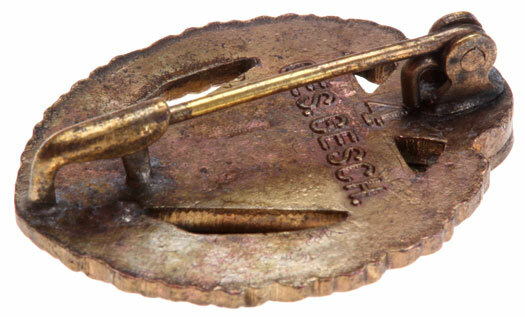 Enameled and gold tombac, 28 x 21 mm, marked "4 Ges. 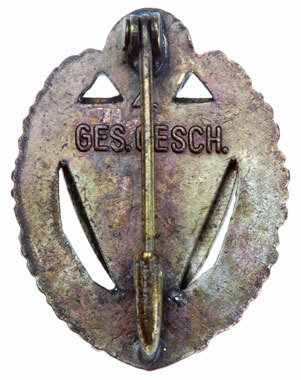 Gesch.," scarce!, light to moderate wear.